Highly productive plants adapt and grow in any garden soil. A prodigious producer, this hardy variety offers up a bounty of large, tender, especially delicious spears. It is remarkably disease-resistant and thrives in pretty much any soil type, even heavy clay. U.S. Plant Patent #06,624. Zones 3-8. Asparagus may be grown from seed sown early indoors and transplanted outside after frost, from seed sown directly in the garden, from transplanted seedlings in fall or from year-old bare roots in spring. Start asparagus seeds indoors 8-12 weeks before outdoor planting date in spring in peat pots, plastic pots or trays. At least 2 x 2 inch cells works best. Sow seeds ½ inch deep in seed-starting formula. As soon as seedlings emerge, provide plenty of light on a sunny windowsill or grow seedlings 3-4 inches beneath fluorescent plant lights turned on 16 hours per day, off for 8 hours at night. Raise the lights as the plants grow. Incandescent bulbs do not work because they get too hot. Most plants require a dark period to grow, do not leave lights on for 24 hours. Seedlings should be 6-10 inches tall with 4-6 stems with several buds coming from the crown when they are ready to transplant outside. Before planting in the garden, seedling plants need to be “hardened off”. Accustom young plants to outdoor conditions by moving them to a sheltered place outside for a week. Be sure to protect them from wind and hot sun at first. If frost threatens at night, cover or bring containers indoors, then take them out again in the morning. This hardening off process toughens cell structure and reduces transplant shock and sun burn. When selecting a site, keep in mind that asparagus is a perennial vegetable and the planting bed should not be disturbed. Early soil preparation is essential in order to establish a healthy asparagus bed. Asparagus prefers full sun and a good organic well drained soil. Space transplants 12 inches apart in a single or double row. Double rows should be 12-14 inches apart. 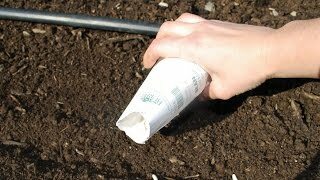 Transplant before temperatures are 90 degrees F.
Direct sow seeds in spring when the soil is at least 60 degrees F.
Prepare the soil by removing weeds and working organic matter into the top 6-8 inches of soil; then level and smooth. Firm soil lightly with your hand, water and keep evenly moist. Seedlings will emerge in 10-14 days at 75 degrees F, a little longer if the soil is cooler. Thin seedlings to about 12 inches apart when seedlings have at least two sets of leaves. Dig trenches 6-8 inches deep and 12-15 inches wide. Space rows 2 ½ - 4 feet apart. Set roots in the bottom of the trench, spacing crowns (centers) 18 inches apart in the row. Spread roots out as far as possible for best root establishment. Cover roots with 2 inches of fine soil and water well. Plants may take 6-8 weeks to emerge. Continue adding soil as the tops grow up, about every three weeks, until the trench is full, which should be about midsummer when planted in early spring. Set plants in the bottom, spacing centers 18 inches apart in the row. Space rows 2 ½ - 4 feet apart. Place the top of the root ball approximately ½ inch below the level of the surrounding soil. Fill with soil to the top of the root ball. Press soil down firmly and water. Keep weeds under control during the growing season. Weeds compete with plants for water, space and nutrients, control them by either cultivating often or use a mulch to prevent their seeds from germinating. Mulches also help retain soil moisture and maintain even soil temperatures. Put down a layer of newspaper 5-10 sheets thick between the rows (soak the papers in water first, so they won't blow away) and then cover the newspaper with dry grass clippings, aged bark mulch, weed-free straw, etc. Always keep mulches off of plants’ stems to prevent possible rot. Keep plants well-watered during the growing season, especially during dry spells. Plants need about 1 inch of rain per week during the growing season. It's best to water with a drip or trickle system that delivers water at low pressure at the soil level. If you water with overhead sprinklers, water early in the day so the foliage has time to dry off before evening, to minimize disease problems. Keep the soil moist but not saturated. Do NOT cut plants back after harvest, allow them to fern and grow as long as they can before frost. They will become quite large. They need the green foliage to make food for themselves to make strong plants next year. Have your soil tested for fertilizer recommendations. Fertilize after harvest and in late summer. In late fall cut tops to ground level when they have turned brown. In cooler climates mulch the ground with evergreen branches or straw after the ground freezes for extra protection. Remove this winter mulch in early spring. Do NOT harvest asparagus the first year. 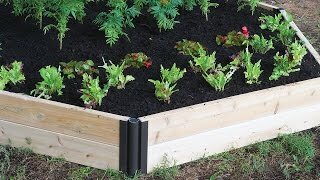 Allow the plants to grow and make food to store in the roots for stronger plants the following year. When plants are two years old you can harvest them for a short period. In the third year you can harvest for four weeks. Harvest when new spears emerge in spring. Harvest when spears are about ½ inch wide. On average spears should be 6-8 inches tall. Using a sharp, clean knife, cut young spears at ground level and set in water with the cut side down until you are ready to store the spears. Some gardeners prefer to snap the stems, but this can cause damaged tissue which can result in disease issues. Harvest frequently before spears start to leaf out. Do not harvest spears less than ¼ inch in diameter. Prepare as soon as possible as fresh asparagus is best. Asparagus also freezes well for later use. Sort the spears by thickness and “blanch” smaller ones 1 ½ minutes, medium for 2 minutes and thickest for 3 minutes. To do this, drop the spears into boiling water for the recommended time, then plunge into cold water to stop the cooking, drain and store in freezer bags or vacuum bags. Asparagus, Jersey Knight is rated 4.5 out of 5 by 24. Rated 5 out of 5 by Lima from Hardy and forgiving! Ordered the pack of 25 roots of these, but my garden only had room for 15. Carefully planted 15 then threw the rest in a 5 gallon bucket in my yard with some dirt while I decided what to do with them. Completely forgot about them for WEEKS with an awful drought going on. At some point needed the bucket...assumed the asparagus was all dead. Went to dump it out and found that not only were the extra 10 plants not dead, but they were growing happily in the bucket! I was stunned and still looking for a spot for them in my garden. Meanwhile the ones that I planted in my raised bed are doing great...3 ft tall or so and several have put up stalks that are almost big enough to harvest. I'm waiting until next year but they seem to be doing great. Live in southern Colorado, sandy alkaline soil. I amended with our own compost and put some commercial veggie fertilizer down with the roots. Watered near daily during the spring and early summer drought, have not had to water as much the last few weeks as it has finally rained! Very hot and arid here but these are thriving. Will plant more once I have the bed space. Rated 1 out of 5 by Bookfairy831 from Roots were in poor shape upon receipt We ordered this early and waited for the shipping period. Once it came, I was a little shocked by how dried out the roots were but decided to give it a try. Of the 24 roots we planted, only 2 sprouted. I was surprised they came up because of the root condition when they arrived. I think I will stick to my local nursery for root plants. Very unimpressed! Rated 5 out of 5 by Lmali from Vigorous and prolific growers We ordered 25 asparagus crowns this spring, received and planted 27 crowns in late March, and by the end of April every single one was up and going strong. Thick spears too, some a quarter inch in diameter! They kept producing new spears all the way through September, and we were so tempted to go ahead and harvest some but restrained ourselves in the hope of a glut next year. I see other had issues with getting lots of female plants, we luckily did not have that issue. Only one female in our bunch, and since we got 2 extra crowns than we ordered I have zero complaints there. Rated 3 out of 5 by JKHB from Did not receive Jersey Knight The crowns were widely variable for size. some were large and healthy with roots about 8-9 inches, and some were small and desiccated with roots only about 2-3 inches long. But I actually received 27 crowns, and all crowns sprouted so not really a negative point. The ferns are pretty healthy and thriving where I planted them. The reason for only 3 stars is because, unless I'm the most statistically unfortunate person in the world when it comes to asparagus, I did not get Jersey Knight. I planted 20 crowns and gave the remaining 7 to a friend. Six of my 20 plants are female and 3 of my friend's 7 are female. Nearly 40% female plants tells me I did not get Jersey Knight. Rated 5 out of 5 by ANDYP from All are doing well Planted them in April. All of them have grown very well. Looking forward to a harvest next spring. Rated 5 out of 5 by Baunzie from Growing strong. I planted my 12 asparagus sets and now I have 30 plants coming up. They are doing great. The extreme heat and strong winds were very tough on my tomatoes and potato plants, but the asparagus are growing like nothing bothers them. The soil is from my compost heap, and it is still a little acidic from the horse manure, but it doesn't bother the asparagus. I gave some asparagus sets to my neighbor, and his plants are coming along just fine as well. Rated 5 out of 5 by Speechgrl82 from Delicious and VERY easy to maintain! First, I bought this five years ago. And each year it has given me a wonderful crop of delicious asparagus. I do have a slight infestation with asparagus beetles laying their eggs on my poor spears, but if I maintain them, they do great.